last night was Big A's school's Country Fair and all the parents were asked to bake a treat for the cake walk. OF COURSE i took my job super seriously and was going to make THE BEST fall-themed treat there ever was. i'd been seeing this pumpkin cake floating around Pinterest and happened to have a canister of Vanilla Bean Cake mix in my pantry and some pumpkin puree so i thought i'd give it a go. i made a few alterations to the recipe and thought i'd share! i got my mix from Fresh & Easy, but i'm pretty sure Trader Joe's has a very similar mix. add pumpkin puree. this smells sooooo good! Cherish is always giving me a hard time about never eating cookie dough or batter. the whole raw egg things totally freaks me out. i snapped this pic JUST for her!! (eggless batter!!!) love you Cher-bear! after little a and i finished licking our paddles she had batter all over her face and i really wanted to snag a cute shot. so i summoned her over and and asked her to smile. "Sister! come here and give me your best Princess smile!... smile really big!!... say cheese!!!!!!!... please.... please smile for mommy.... please.... "
can you see it? that look of CRAZY SASS in her eyes!?!?! ugh. i love her. and her sassy ways. i used squares of parchment paper for cupcake papers and put a little leaf flag on each cupcake to give it more of an autumnal feel. i also topped each cupcake with Cream Cheese frosting. this recipe is sooooo tasty! i sampled one just to make sure they were tasty and they definitely were!!! although, i think i will take a break on all the pumpkin treats. i don't want to get sick of them before Thanksgiving even gets here! maybe i'll start making stuff with apples and pears. i'm already dreaming of a Pear Berry Crumble. mmmm. 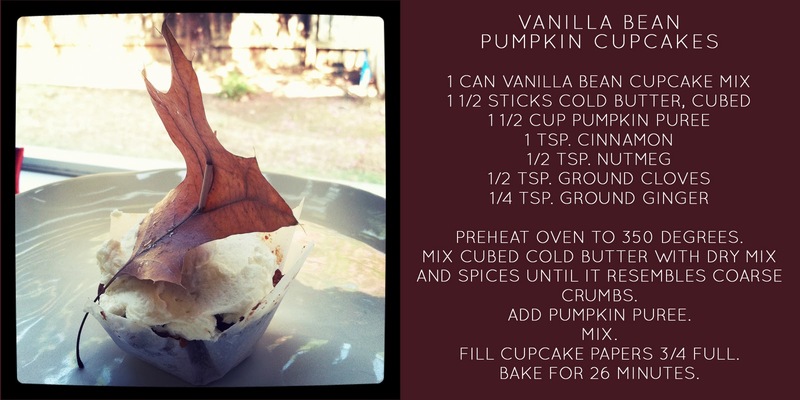 what yummy fall treats have you been making lately? LOVE her in those leopard leggings and high heels with NO smile!